Card Text Play: If your opponent played 3 or more creatures on their previous turn, steal 2 . How does Lifeweb work if my opponent played and replayed the same creature multiple times, such as with Bad Penny or Wardrummer? Each time a creature is played, it is considered a completely new instance of that creature, even if it’s the same card played multiple times. 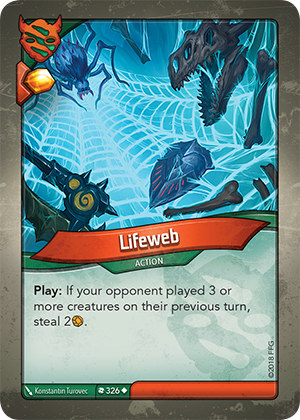 Therefore, each time a creature is played, it counts for Lifeweb, even if a creature is returned to its owner’s hand and played multiple times.